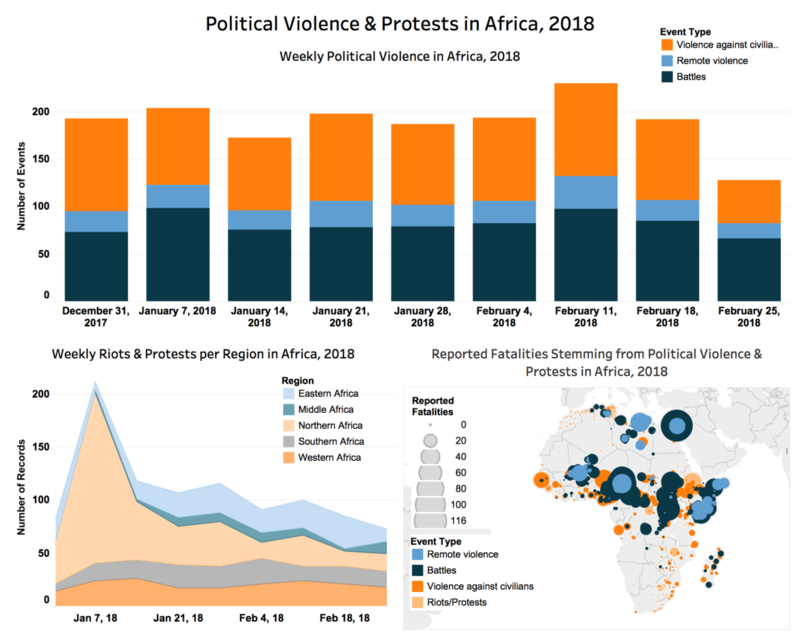 Political violence and protest events in Africa over the week of 25 February showed at least three key developments and points of concern. First, Islamist militants attacked for the third time since January 2016 Burkina Faso’s Ouagadougou. The militants struck both the army headquarters and the French embassy, resulting in 16 killed among both the militants and soldiers, and dozens more injured. This attack raised a number of concerns – not least the limited ability to anticipate them. Second, the Democratic Republic of Congo (DRC) remains one of the most active countries on the African continent, with several centres of conflict. Among them is the rising discontent over president Kabila’s prolonged stay in power, as echoed in last week’s protests called by the Lay Coordination Committee (CLC). Activists protested in dozens of towns across the DRC despite a government ban and clashed in several places with the security forces, resulting in three deaths in Kinshasa and Mbandaka (Equateur). The successive visits of four African heads of state in just over two weeks is testament to the mounting regional concerns over the situation in the DRC and of Kabila’s growing political isolation. Third, Nigeria is once again becoming very active. Fulani herders have been involved in an increasing number of violent incidents over the past weeks, while religious cohesion proved shaky last week in Kaduna state as Christian and Muslim militias clashed leaving a dozen killed. Joint Nigerian and Cameroonian operations last week cleared Boko Haram from a number of areas In Borno state, but the group quickly reacted, killing three UN aid workers. How the government will react to these evolutions could prove a test of president Buhari’s potential for re-election in 2019.